1.Preheat oven to 375°. Spray 2-quart glass or ceramic baking dish with nonstick baking spray. 2.In large bowl, whisk together 1/2 cup sugar, 1/2 cup flour, cinnamon and ginger; stir in oats. With fingertips or pastry blender, work in butter until pea-sized crumbs form. 3.In medium bowl, toss mango, blueberries, and remaining 1/4 cup sugar and 2 tablespoons flour. 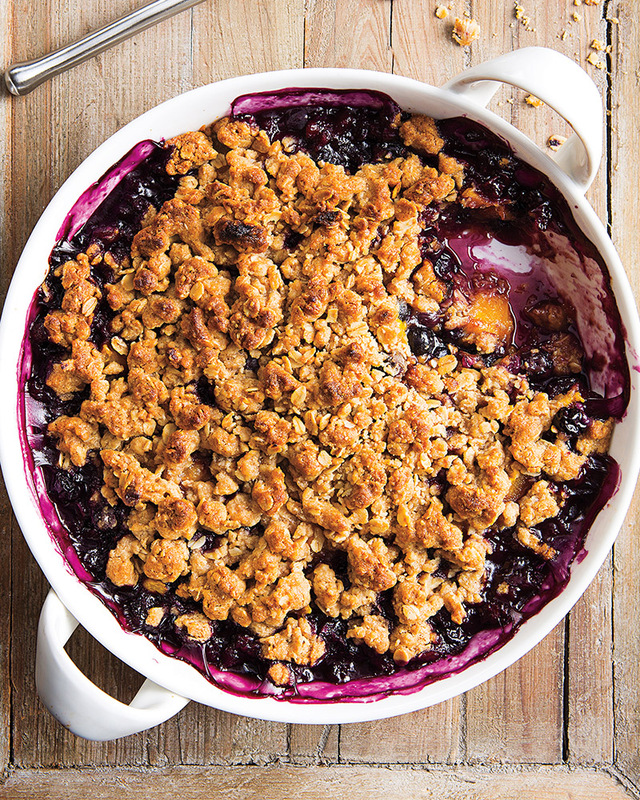 Spread blueberry mixture evenly in prepared dish; sprinkle oat mixture evenly over blueberry mixture. 4.Bake 40 to 45 minutes or until most berries burst, sides are bubbling and top is golden brown; loosely cover with foil if top is browning too quickly. Let stand 10 minutes before serving. > To cut a mango, slice off the fattest parts, called the “cheek,” on both sides. Score the “cheek” by making shallow cuts with a paring knife. Make each cut about ½ inch apart, and then turn the “cheek” and make perpendicular cuts as well. Once scored, press the back side of the mango so that all the flesh is standing at attention and trim off the flesh from the skin. Cut around the reserved pit with a paring knife.